Ah, September! For most schools it can only mean one thing: the start of a NEW TERM! Amid all the rushing; preparation; panic; confusion; and knee-jerking excitement / fear, it's important to find time where you can. To help out, we've put together a handy #BackToSchool Marketing Checklist. #HappyDays. Studies have shown involved parents will have a greater impact on their children's education. If you have a platform where parents can see their children's progression through your school, it can lead to driving parental involvement up. Most schools nowadays will have a presence on social somewhere. For most, it will be a Facebook Business Page. For others, this could include channels such as Twitter, LinkedIn, Instagram and YouTube. Whether it is one channel or 10, there needs to be a sense of clarity between your social media and your school's vision. Does your social media page reflect your school's theme? In other words, if you advertise your school as being traditional is this represented within your social media? Look at the headers, profile icons and the content you are posting. Do you have a brand message? Consider your website - what is the core message and does it translate across your social media? If you have multiple platforms are they consistent with one another? Is your naming strategy consistent throughout? Does each social media outlet have the same school crest as it's profile picture? Do the headers match or follow a theme of sorts? If the answer is no, then it would be highly worth making some small but effective changes. This video from Wimbledon High School is a fantastic example, driving home their core message and homepage strap line, "Imagine". Now look at their social media sites for Facebook, Twitter and Flickr, alongside their website. What trends should I be looking at? All of these are hitting the social waves hard at the moment. In education, LIVE streaming, video content and VR / AR are particularly prevalent. It has been exciting to watch the big companies duke it out for dominance in these markets (i.e. Facebook vs Twitter vs Google for LIVE streaming, or Google vs Facebook vs Microsoft vs Apple for VR / AR). For more information, take a look at our 2017 social / digital predictions for schools. The power of stories heralds back to the very first signs of man; beginning as drawings on cave walls. Storytelling itself has never changed throughout all of history, only the way stories are told. With social media, we now have a platform that has incredible potential to reach billions of people in a small amount of time. 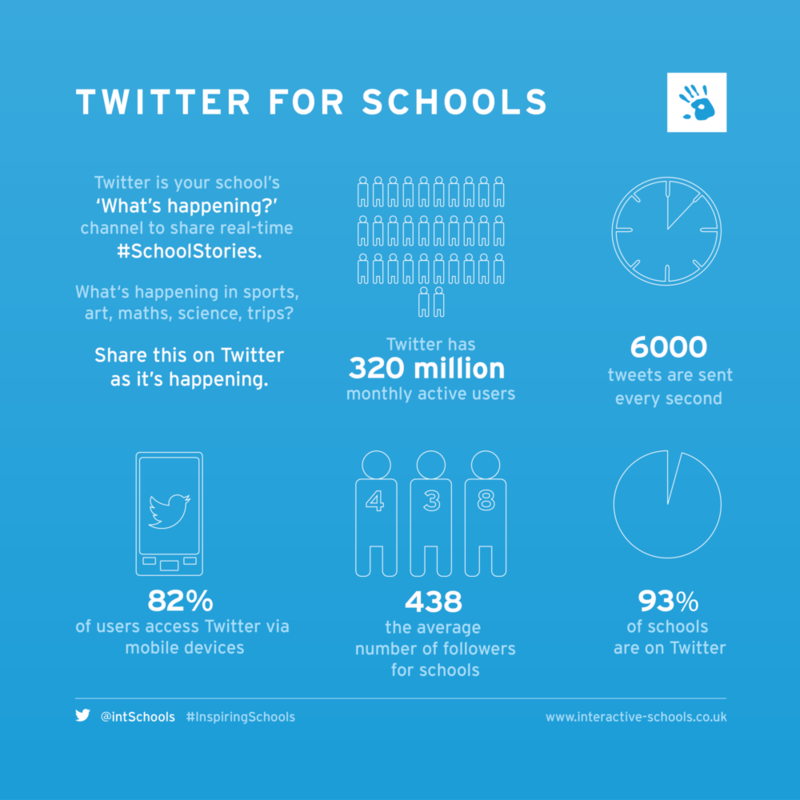 The way we want to see social media leveraged by schools is as a platform to share amazing #SchoolStories. #SchoolStories are authentic moments captured by your school and shared to your community. Twitter has proven an incredible social network for this, but each different channel brings something new to the table. We are experts at creating a #SchoolStories content strategy for schools, and we'd love to do it for you too! Contact us to talk about our social and parent comms opportunities. 1. Does your marketing STAND OUT? What will make you different from your competitors? Social is BIG! You can't afford to be a needle in the haystack. To have impact, you need to have emotional impact on the end users: parents, pupils and prospectives. 2. Does your social naming match throughout? This is one of the ways we believe will make your social media STAND OUT. This becomes a direct representation of your brand on social media. 4. Is your process to communicate with parents streamlined? This isn't just about responding to queries raised by parents on social media. It is about how you get information to them. Take your school email newsletter. Does it take ages to put the newsletter together? Do you use analytics to determine the impact of your newsletter? Do parents even read the newsletter, or does it go straight through to spam? We would therefore love to invite you our #BackToSchool Marketing Strategy Days, running across the world throughout September and October. View our upcoming events and BOOK. By the way...it is completely FREE!!! We hope that this guide has aided you in your #BackToSchool preperations. We'll be keeping our ear to the ground for all your #SchoolStories.